The Indian python is a non-venomous python species found in southern Asia. There are two subspecies, the Burmese python (P. m. bivittatus), found in Burma, China, Thailand, Indo-china, and Indonesia, and the endangered Indian python (P. m. molurus), found in Pakistan, India, Bangladesh, Nepal, and Sri Lanka. In India, this python is considered the largest known snake species. Adults can grow up to 20 feet long and the average weight is 70 to 129 lbs. Some rare 30 foot long pythons (weighing over 300 lbs) have been observed. Indian pythons are brown, yellow, cream, or off-white in color, with dark brown to black markings. They have flattened heads with small eyes and large nostrils situated high on the snout. There is also a V-shaped mark that appears on the head. The Indian python can be found in a wide range of habitats, including valleys, woodlands, forests, grasslands, swamps and marshes, and rocky foothills. There must be a good source of water within its range since this species depends heavily on it. Diet consists of birds and mammals such as rats, pigs, monkeys and even leopards and deer. This species is solitary and nocturnal and prefers to hunt at night. Prey is tracked by its scent, and then the python is able to locate and kill prey by watching its movement and sensing its body heat. When prey is caught, the python uses its coils to suffocate and crush the prey to death. Breeding occurs in November thru January. 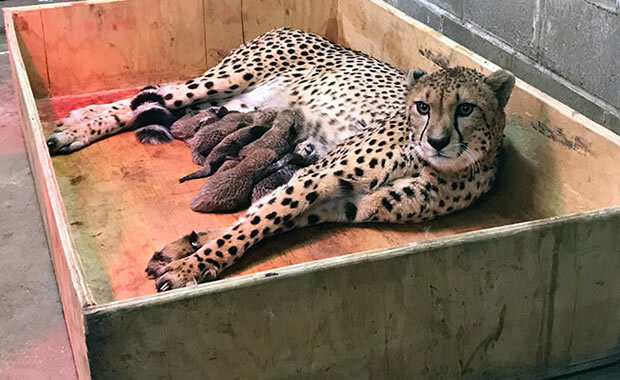 The female lays from 20 to 100 eggs, depending on her age and health. The young eggs hatch about 60 to 80 days later. Indian pythons are also easily bred in captivity and can be found in zoos. They are docile creatures, even when found in the wild. The main threat to the species is habitat loss due to agricultural development. Some Indian pythons are illegally killed for their fine skin or for meat, which is eaten by locals. Also the fat contained in their skin is used in medicine. 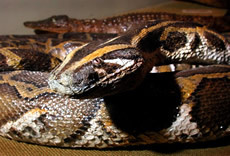 Indian pythons are protected by the Tamil Nadu Government, and the trade of pythons and any product that contains python parts is prohibited. Glenn, C. R. 2006. "Earth's Endangered Creatures - Indian Python Facts" (Online). Accessed 4/25/2019 at http://earthsendangered.com/profile.asp?sp=384&ID=3. Need more Indian Python facts?